Moghrabieh is big couscous. I got some in my Ottolenghi food box for Christmas this year – and this is the first time I’ve used it. I have some dried limes too – I just haven’t found a recipe that uses them yet! 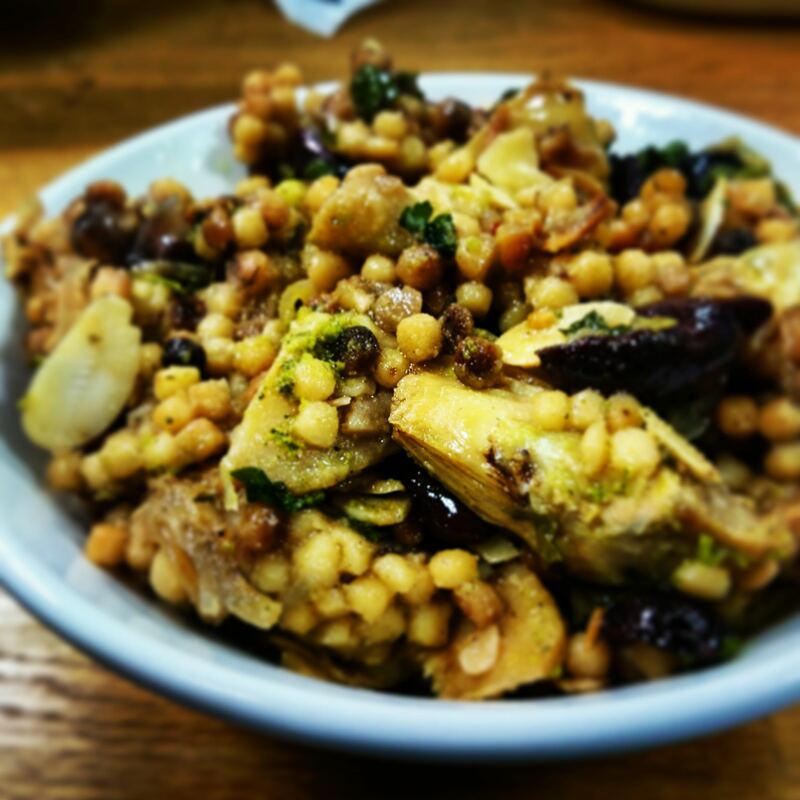 You can find this recipe in Yotam Ottolenghi’s – The Cookbook, BTW – the book is full of awesome recipes which I will hopefully come back to sometime soon. I wasn’t intending on making this yesterday – but it was one of very few things where I knew I had all the ingredients. Both of us were off work with ‘the flu’ and spent most of the day sniffing and coughing and feeling sorry for ourselves. By 4pm we realised we really should eat something but the cupboards and fridge were somewhat bare. We’d made a mistake in not doing our shortlisted order with Ocado on the Sunday and were paying the price today. We’d have to wait until tomorrow for a grocery delivery. Modern day shopping really does make you lazy! We have a reasonable excuse. Our nearest grocery store is 12 miles away in Henley and you just can’t beat the quality of the groceries that Ocado delivers. This is quite easy to make – but will take two hours to be ready (minimum). Even longer if you make the Labneh that is recommended as an addition. Labneh takes a day to make at least – I cheated and used some feta. Feta is a handy swap for some cheeses as it means you can reduced the amount of salt you put in food. And I always have feta. You have to slow roast a lot of tomatoes in a balsamic glaze and wait for them to ‘dehydrate’ – I left them on the lowest setting of my oven. While you wait for the tomatoes, caramelise some onions. Then prepare the Moghrabieh until it is al dente. Drain and leave to cool. Then prepare the couscous in some vegetable stock. You have a lot of time to do this. Those tomatoes take a long long time! We even went for a nap. Once the tomatoes are ready, mix the couscous, moghrabieh, onions and tomatoes in a serving dish – including all the tomato juice and some Nigella seeds and mix a little. Add some Nigella seeds and more Olive oil as a topping and you are done. Dress with cheese if you want ! This makes a lot of food. So either reduced your quantities, invite your friends round – or be prepared to eat it for a few days! 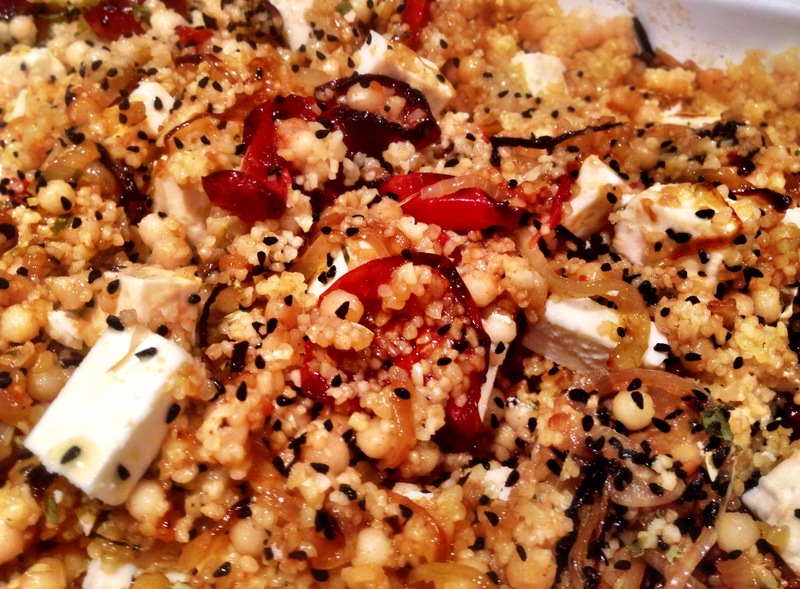 I swapped couscous with bulgar wheat – because I forgot to check I had all the ingredients. I don’t think it makes any difference – they are quite substitutable apart from the preparation time. This is one of those recipes that you should be able to make any time of year as there are no seasonal ingredients to worry about. It’s also great because you will always have leftovers for work the next day! Just make sure you get really tasty tomatoes! In hindsight I should prepared more tomatoes. They are the centre of the dish and I don’t think I had enough of them in relation to the grain. Other than that this dish is spot on.